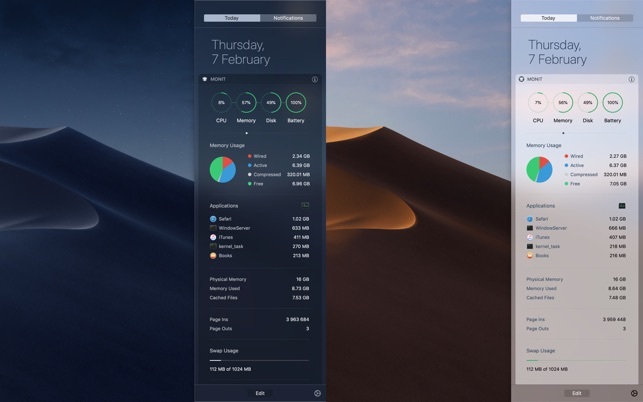 Slide out Notification Center to quickly see key performance data for your Mac, such as CPU, Memory, Disk, Network and Battery. Click the charts to drill down and reveal more details. Click the Network and Disk Icons to view even more data. 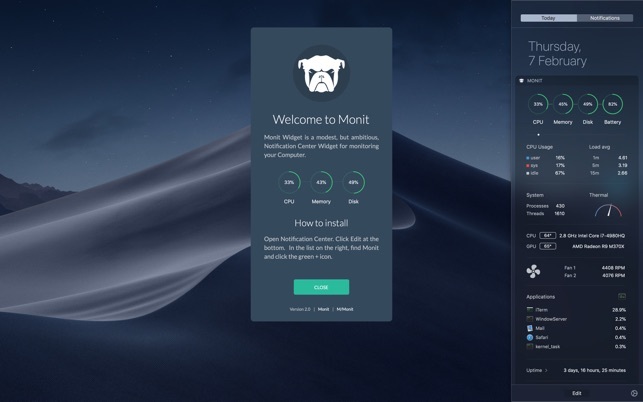 Monit Widget is a modest, but ambitious, Notification Center Widget for monitoring your Computer. Please see https://mmonit.com/widget/ for more details. 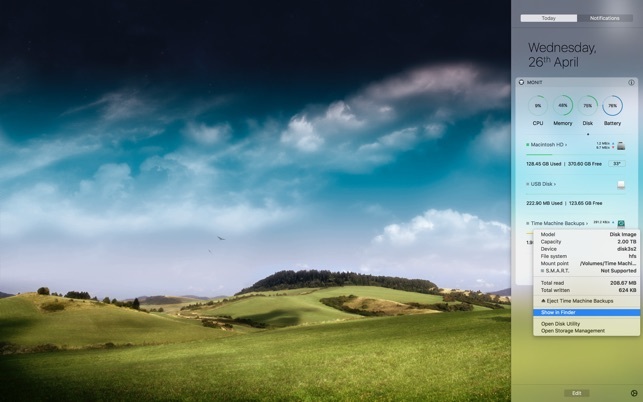 ● The Widget connects to an external host to get your Public IP-address. This is the only reliable way to obtain your address. No data is sent, only read. 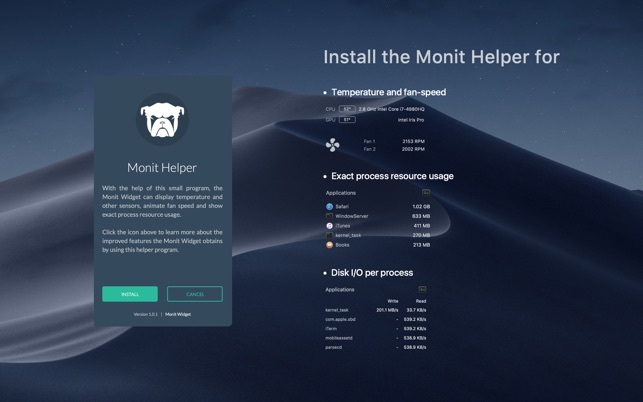 ● Temperature, fan-speed, disk i/o and exact process resource usage are available by installing a small helper program from https://mmonit.com/widget/ The Helper uses no CPU when the Monit Widget is not running and less than 3 MB of ram. ● The Top-5 App List shows App CPU usage normalized (0-100%) across all CPU cores. This is a bigger update which brings sensors information to the widget and exact process resource usage. A small Monit Helper program is needed for the cool stuff in this release. The Helper program is free and can be downloaded from our Web-Pages. Here is a summary of changes in this version. New: Show Time on Battery since Boot for MacBooks. * With the Helper, the 'top five lists' of processes using CPU, Memory and Disk i/o is exact and include all processes running on the system. Values are aggregated into the parent process so it is possible to, for instance, see how much Memory Safari is using by including all its sub-processes. This app is great. It shows technical information regarding your computer’s processes, which is extremely useful for those that use their computers intensively. Apple should have released this with its laptops, instead of it obscures it behind various utility apps. Notification preferences. 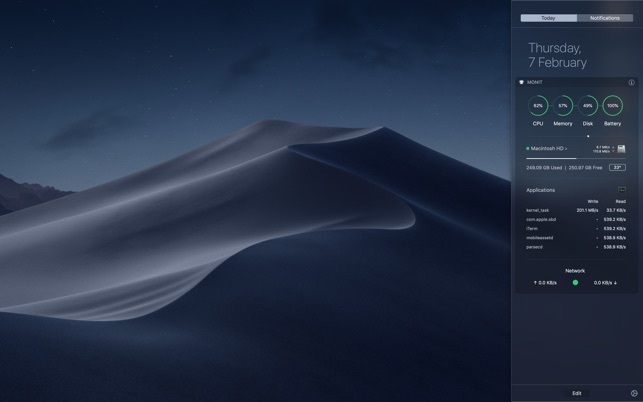 It’s great that I get notifications regarding changes in my system, but the inability to turn them off is absurd; I don’t want a notification beep telling me that I am connecting to WiFi EVERY SINGLE TIME I OPEN MY LAPTOP. This app is also missing customizable views. It would be great to select precisely what I want to see when I slide open my notifications. Finally, this app is missing the ability to be opened as a standalone app. 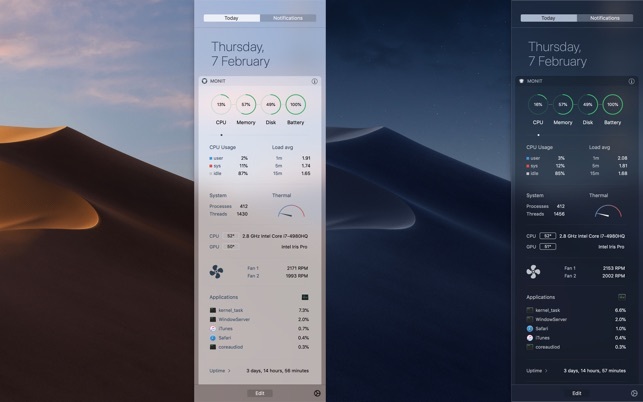 While it serves its functions well, Apple’s implementation of notification center is counterintuitive without a trackpad and, for my money, this app should accommodate those use cases. I want to emphasize that these are nitpicks, small features that I think should be included for the money I spent on it. This is an otherwise great app which I would whole heartedly recommend. This "app", being primarily in the today/notification sidebar, is pretty fantastic. I'm very happy with it. I hope it continues to improve over time, just a little. I think my only request, as a user of a late 2013 Mac Pro is for some insight into the graphics card usage, and maybe more options for temperature display. It always seems to be on the cooler side of the needle, but the fan is running so …? Thanks. If the fans are running the needle should definitely move. Unfortunately, it seems that Apple's Thermal API does not work properly on Macs before 2015 which affect this functionality. There aren't many alternatives for a sandboxed app, but we'll look into creating a helper app to display temperature proper, though it will have to be downloaded outside the AppStore and run non-sandboxed. This app being in the notification tray is probably one of the best, most clean and comprehensive monitors without having to open activity monitor to identify what’s going. 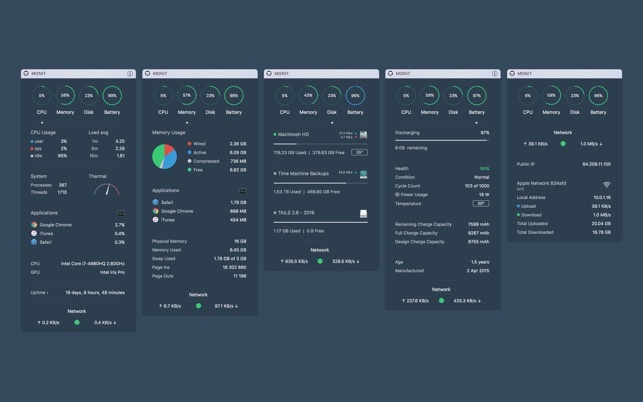 This fits users from the everyday user to the IT pro who runs multiple VM’s inside of a Hypervisor and needs to see if there are enough resources available or identify a bottleneck.